On our way home today, we passed the “Mission Farm” that has huge fertile fields in one of the valleys we drive through all the time. 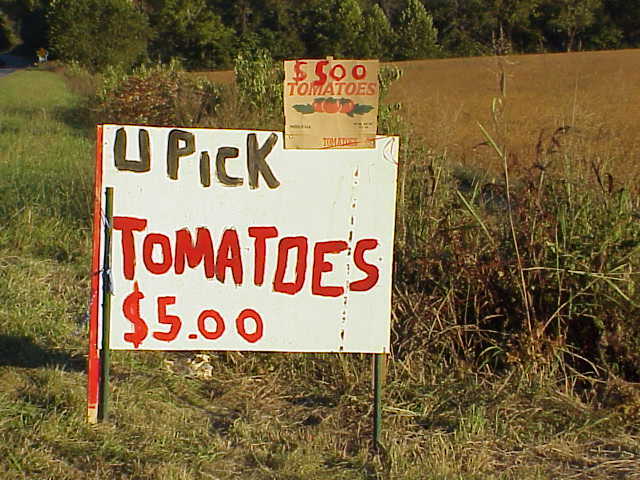 There was a spray painted sign “Tomatoes, u-pick $5.00 bucket” so we turned in. The tomato plants went on forever and there were only two kinds, according to the lady who ran it, “round ones and oval ones”. 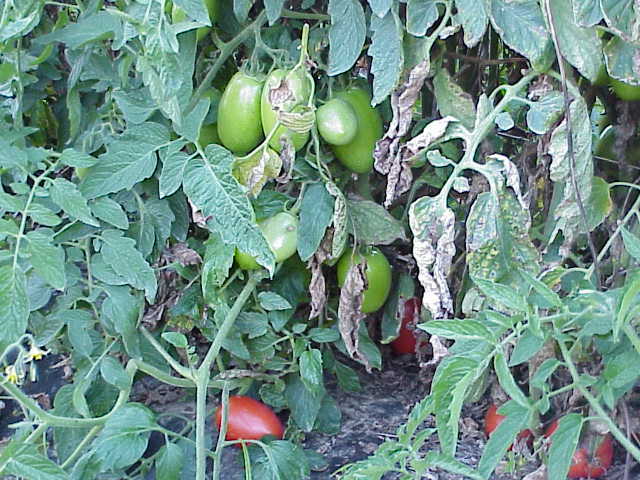 The ground was covered with fallen rotting tomatoes and the plants were loaded with all sizes of the luscious fruit in various stages of development. The air was thick with the smell of tomatoes, both ripe and rotting and the unique odor that a tomato plant gives off when disturbed. At first I didn’t think we would really find much but as we eased our way down the rows. There were more tomatoes than we could ever pick and certainly more that I could ever process in a reasonable time. Tyler was spotting them better than me. I guessed it was his eye-level advantage. However, the fruit were lit up like ornaments in the long rays of the late afternoon sun. It was the first time Tyler had ever picked tomatoes. In the past he has always been a tomato hater. But today, he said he would actually like to try to eat some. 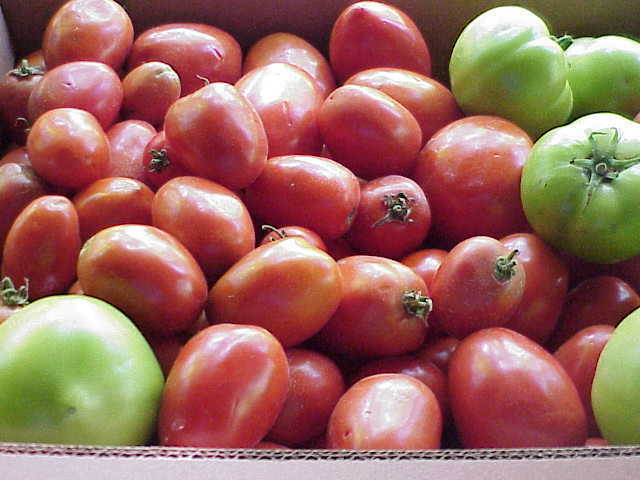 I remember my mom and me going to my dad’s garden and plucking firm ripe red tomatoes from the plants. While they were still warm from the sun, we would wash and slice them. We would sprinkle salt and black pepper on them and eat mass quantities. That is still my favorite way to eat tomatoes, warm from the sun. 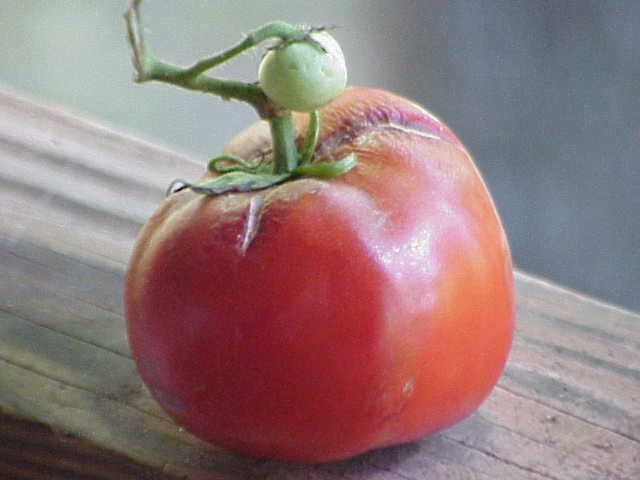 That has remained my measure of a quality tomato, even to this day. Today, I feel like I’ve been given a second chance to capture some of summer’s goodness. 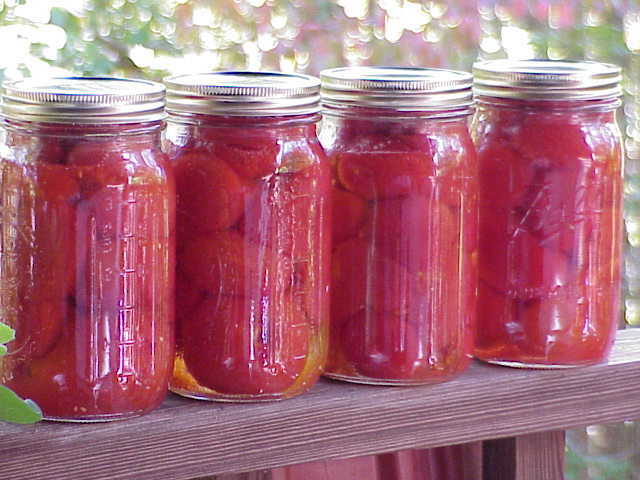 I shall can these and set them up in their clean glistening Ball and Mason jars on the walls of my basement steps to open and savor the goodness of a warm summer day sometime this winter, while it is snowing outside. Fast forward 10 years and today I am harvesting the last of the tomatoes from the vines. Tonight will frost. There are enough green ones to make my grandmothers green tomato chow-chow and red ones for the last of the tomato sandwiches and dinner salads. Tyler still does not eat tomatoes, although he did try fried greens, once. This entry was posted in Memories of Mountain Living. Bookmark the permalink.